DriverTags™ are the hidden motivators to program choice – and apparently a lot of other behaviors. They drive 76% of the variance in Nielsen ratings, a higher predictivity than the industry ever achieved before. These 265 words were distilled from over 13,000 words, all the psychological words in the English language, starting from inspection of all the words in the English language. Distillation was accomplished by factor analysis of proprietary national probability surveys, and then use in set top box based personalized program recommender. These 265 words now called DriverTags™ had the highest correlation with a subscriber becoming a loyal viewer of a never-watched-before program that had been recommended by the artificial intelligence (AI). What Did The Public Think of DriverTags™ Based Recommendations? The most common verbatim was “It gets me!” People understood that some form of artificial intelligence was involved and they were surprised at how well the system understood their viewing preferences. Over 90% of voluntary button presses were on the Applause button and fewer than 10% on the Boo button. 65%-80% of brand ROI is creative, and +36% additional ROI lift comes from priming that creative with a DriverTags™ resonant program environment (ARF Turner Nielsen Catalina). DriverTags™ can be attached not only to programs and ads, but also to the people who watch them, and these data can be aggregated to brand targets, to better inform the creative brief, which will positively influence the 65-80% of ROI that is the creative. In order to achieve DriverTags™ attached to people, RMT collaborated with StatSocial, which uses proprietary algorithms to parse social media data into 253 nuanced classifications that RMT found could be used to predict DriverTags™ with 89.2% accuracy using 265 multiple regression equations. Thus there are now 93 million digitally reachable Americans with DriverTags™. Because DriverTags™ were developed from set top box data, using a personalized program recommender which achieved six times the conversion rate of tune-in advertising, using DriverTags™ in tune-in advertising is a no-brainer. 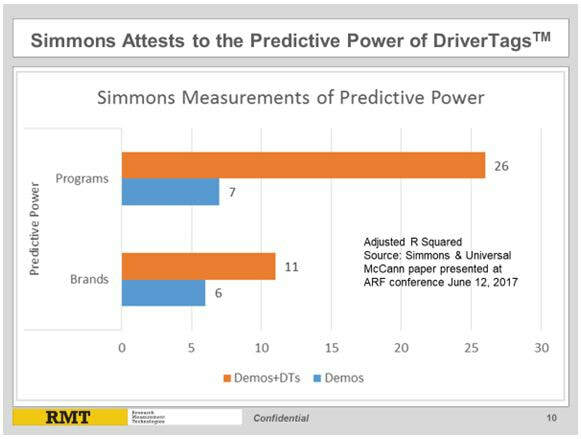 Simmons found DriverTags™ far more powerful in predicting program viewing than in predicting any other form of brand usage. And yet Nielsen Catalina, and 605, separately and independently found 36-37% advertising effectiveness increases from DriverTags™ for CPG brands. How much higher percentage lifts will be found in tune-in! DriverTags™ can also be used to pack pods with ads so as to maximize audience retention through the pod. This has the double benefit of (a) to the advertiser and (b) raising the program ratings by increasing the whole program’s average retention and therefore its C3/C7 etc. rating. It’s a current fallacy that you can deal solely with exposure and transaction data and gain a full picture of a marketing situation sufficient to maximize ROAS and longterm brand equity. As Mike Donahue says, the funnel flows from the high to the low end. Focusing solely on the bottom end means you will be blind to what caused it and ignorant of how to repeat successes but not failures. The problem leading practitioners to flee the high end of the funnel is the valid distrust of survey stated data, out of valid love of census passive data. In 2005 Harvard’s Gerry Zaltman taught us all that survey data can never capture more than 5% of what causes behavior. Because the verbal mind is not in touch with the subconscious which drives 95% of behavior. So ideally what the industry needs to measure the top end of the funnel is something new that is not coming from survey data and which scales like transaction data. That something new is called DriverTags™. A systematic scientific process reduced the million+ words in the English language to 265 psychologically oriented words that account for 76% of what drives choice of audiovisual content and also drives choice of brands. Those 265 words (a few are short phrases) are the DriverTags™. Nielsen Catalina showed that when an ad which has e.g. 30 of those DTs is placed in a program that has 20 of those 30, ad-produced sales goes up avg. +36%. No surveys are used in DTs. They come from passively observed behavior such as set top box (STB) data and Natural Language Processing (NLP). 93,000,000 Americans DTs are now known at the individual level. They are being used today to inform creative and media decisions. In media they affect not just targeting but also context matching. In targeting they specialize in extending audience beyond current users to brand growth targets who resonate with the DTs in the specific ads the advertiser is using. The NLP sources validated to produce DTs today are StatSocial Passion Clusters and IBM Watson Personality TextAnalyzer. DT science is additive to everything else good the industry is using. DTs do not replace anything else nor can they be replaced by anything else. DTs have a Zero Privacy Harm Footprint. They are used with double-blind matching.